The Astounding & Tragic Costs of Fatal Car Crashes in the U.S.
> Auto Accident > Deadly Auto Accidents > The Astounding & Tragic Costs of Fatal Car Crashes in the U.S. Putting a value on human life is impossible, as the loss of one person – especially if that person is someone whom you love – can be profoundly devastating. And no sum of money may ever make up for such a permanent loss. In terms of medical bills and lost productivity associated with deadly car accidents, however, the numbers are more concrete. In fact, according to the National Highway Traffic Safety Administration (NHTSA), in 2010, car crashes (both fatal and nonfatal) cost nearly $1 trillion in terms of medical expenses and lost productivity. Given that deadly crashes have been on the rise in the U.S. in recent years (as the NHTSA recently revealed), these costs are expected to climb in the coming years. More than 30,000 Americans die in car accidents each year in the U.S., making motor vehicle crashes among the top 10 causes for people younger than 55. In Colorado alone, more than 500 people were killed in deadly car accidents in 2013, costing approximately $647 million in terms of medical bills and lost productivity. Who Pays the Costs associated with Vehicle Related-Deaths? Driver impairment – Alcohol impairment accounted for more than 10,000 lives lost in deadly car accidents (in 2013). Driver fatigue – Drowsy driving contributed to nearly 21% of all car accident fatalities. Other driver negligence – While speeding contributed to about 9,600 traffic-related deaths (in 2013), running red lights played a role in nearly 1,000 deaths resulting from auto crashes. 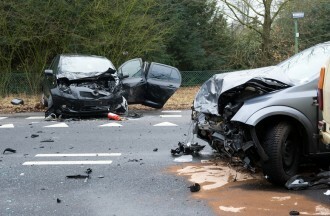 How Can Colorado Prevent Deaths Due to Car Accidents? Continuing the graduated driver’s license system for teenagers. If you have been injured in a car accident, it’s time to contact a trusted Littleton car accident lawyer at Bahr, Kreidle & Flicker. Since 1983, our attorneys have been fighting on behalf of injured people while working diligently to help them maximize their financial recoveries.